We teach self defense, MMA, kid’s karate, & functional fitness. Click here to set up your FREE introductory lesson today! 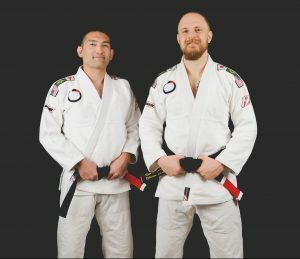 We are head instructors Brian Yamasaki and Brandon Kiser. We have been studying the Martial Arts for over 2 decades and have run Mushin Self Defense, Davis County’s longest running and most successful gym, since 2000. We were Davis County’s first studio to provide the public with Brazilian Jiu-jitsu, Submission Wrestling, and Thai Boxing instruction. Our goal is to provide professional Martial Arts Instruction to anyone interested in learning in a disciplined, respectful, clean and safe environment. We offer classes for beginners, and experienced students, Kids, Adults and everyone in between. Brandon Kiser is a Full Instructor under Sensei Erik Paulson and a Black Belt in Brazilian Jiu-jitsu under William Bernales. Brian Yamasaki is also a Full Instructor under Sensei Erik Paulson and a Black Belt in Brazilian Jiu-jitsu under William Bernales. In addition, Brian is a Certified Instructor of Muay Thai under Ajarn Surachai “Chai” Sirisute. When you come to our gym, you can expect the highest levels of professional instruction from qualified coaches. We vet each and every one of our students to ensure that when you come to class you are surrounded by friendly, safe and helpful students who are just as excited about helping you reach your goals as they are about achieving their own. If you have any questions about our gym, please call us at (801) 296-0734 or leave us a message on our contact form. We’d love to hear from you.